Dream no more...The dreams of many are becoming reality as each contractor steadily works at this fantastic swimming and family beach on the Pacific Coast of Nicaragua. Within a few months, these starter homes will complete and guests will enjoy the multitude of sunsets, fresh fish, warm water swimming, surfing and clean comfortable living at the largest free hold, true beach front development in the country. The land security and services are ready to support high quality dream homes that only are contained by your imagination. These pictures are of the house in construction at Playa Tesoro lot #35 over the month of March 2014. Depicting various stages of the construction, but all of the same home. This house is for sale, and will complete April 2015. If you purchase now, you are free to choose interior finishing materials, landscaping, garage etc. The general concept is that this home is road side and will become a guest house in the future. The beach front land remains available for a future multi level home with a pool. Playa Tesoro lot #35 is 55 feet wide and 208 feet deep and is nestled between ocean and river, providing easy access to both. The beach is a physically perfect family swim beach, while the river is also pristine and untouched beauty. It is debatable whether river or ocean offer a more fantastic experience. We are open to offers on this house as an outright purchase or buy a portion of the whole. Playa Tesoro Lot #36, a 60 foot wide lot, is available for purchase at this time and neighbors this house site. So, you can buy both lots and have 115 feet in ocean beach frontage. The development swimming pool is to be constructed next door. Come join our fascinating group of adventurers at Playa Tesoro. Let us build you an exquisite beach home. Relax in the sunset after an active day on the 1500 acre island, and tell us some of your stories ! As of January 30, 2014 there are 110 lot side water connections fully functioning and ready to build truly amazing beach homes. Clean, fresh drinking water is here!! After laying another 1300 pieces of 3 meter pvc pipe covering 3.9 kilometers deep in the ground, from The Playa Tesoro site entrance gate to the most southern lot #62 of our property, the valve was opened January 30 2014 and the system extension filled. After another four months of excavating and gluing pipe, over 1000 gallons more water filled the line and the 110 water line connections are ready for house construction. 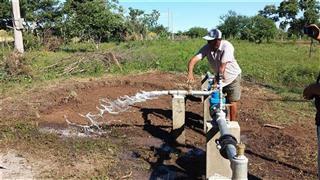 This is more than adequate supply of top quality water for 400 homes at Playa Tesoro. The management of Playa Tesoro are most pleased that this project is complete and on schedule. The system was successfully pressure tested for leaks, and the water tested several times for cleanliness. This is top quality, fresh drinking water with a clean fresh taste. No salt whatsoever and almost infinite volume. A great water system in any country. From this point, the beach house construction started immediately in Feb 2014 with electrical meter installation, site prep and building permit applications. This phase of the island infrastructure project is built and owned 100% by Playa Tesoro, and is solely for the private use of its clients. Any other island owners are welcome to contact us for prices to connect to the electricity system.